God, make a fresh start in me, shape a Genesis week from the chaos of my life. Don’t throw me out with the trash, or fail to breathe holiness in me. Bring me back from gray exile, put a fresh wind in my sails! Give me a job teaching rebels your ways so the lost can find their way home. Commute my death sentence, God, my salvation God, and I’ll sing anthems to your life-giving ways. Unbutton my lips, dear God; I’ll let loose with your praise. 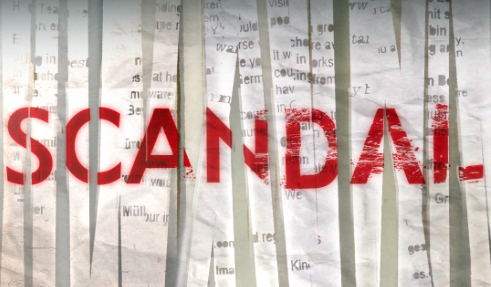 Several of my friends in the DC metro area are addicted to the television show “Scandal.” They say they watch it for the DC scenery… but we know the real reason they watch. They’ve talked about it so much, that even though I haven’t watched an episode (yet), I feel like I know what it’s all about. I mean, it’s called Scandal, right? And every day we see in our newspapers, on the internet, on tv the seeds for potential future Scandal episodes. David Benyishay is a charismatic leader of a world power. When he first took office, it seemed that the entire world was in love with him. He could do no wrong — he was the golden boy. But he has been in leadership now for several years, and he is feeling a bit bored with it all. He has sent off his staffers to a conference on his behalf with another nation. Even though he knew it would be a tricky, dangerous negotiation, and he really should have gone with them, he decided to stay home instead. He has lost interest in it all. He has also lost interest in his politically-connected wife, the daughter of a man who held the position before David. David is wandering around aimlessly one day, and catches a glimpse of a beautiful woman. He follows her for a bit, then strikes up a conversation with her. He quickly learns that she is the wife of one of his staffers, Yuri, who is away at the conference. The woman’s name is Beth, and David finds her deeply intriguing. They fall into easy conversation, which lasts for hours, into the night. He invites her to come back to his house for a drink. One thing leads to another, and David and Beth engage in a brief, intense affair. The last scene of the episode is of Beth in her bathroom at home, staring blackly at herself in the mirror. Just before the screen fades to the credits, the camera pans down to the pregnancy test lying next to the bathroom sink. Positive. Over the next few episodes, we see how David spirals out of control after Beth breaks the news to him. First he calls Yuri home from the conference, and tries to manipulate him into a position where he would claim Beth’s child as his own. Several more attempts to “fix” the situation fail, and, then, in a moment of panic, desperate to protect his political image, David has Beth’s husband killed. A few more episodes go by, focusing on other storylines. But, then, after several weeks, we come to a scene where David’s straight-talking Chief of Staff, Nathan, comes into his office. Nathan sits down across the desk, and starts to tell David a story about a man who betrayed his position of power, hurting the very people he was charged with protecting, destroying a family, and putting his nation at risk. Eventually David recognizes that the man his trusted advisor is speaking of is him. David is finally forced to acknowledge what he has done, and to take responsibility for his actions. A Scandal plot line, straight from the Bible. With a few minor tweaks, of course, to update the story 3,000 years. If you’d like to read the original story, it’s in 2nd Samuel, chapters 11 and 12. David, the King of Israel, called “a man after God’s own heart,” falling miserably into sin and chaos. It’s a deeply tragic story: David and Bathsheba’s affair. Instead of leading his army in battle, King David chose to stay behind in Jerusalem. While idly passing the time, he slept Bathsheba, who quickly becomes pregnant. Her husband Uriah was a soldier in David’s army, but following several unsuccessful tries at covering his tracks, David had loyal Uriah killed. When confronted by the prophet Nathan, David admitted his sins, and cried out, “I have sinned against the Lord” (2 Samuel 12:13). And, indeed, he has. Sloth. Lust. Envy. Greed. Anger. Pride. (The only of the “seven deadly sins” that I can’t find a way to connect with this story is gluttony.) David threw himself on the mercy of the God who had faithfully loved him, even when David had turned his back on that love. David still faced the consequences of his actions, but God was still there for him. As much of a scandal as David had made of his kingship, as much as he had done wrong, God still loved him. God still wanted him. No matter what we have done, no matter where we have gone, no matter how far we have wandered, no matter what… God still loves us. God still wants us. Always. This always breaks my heart. God’s love is the one constant in the universe. God’s arms are the one safe place to run to with all our fears and failures and brokenness. And the church community must be a place where all people can come, knowing that they will experience love, grace, and forgiveness. After all, that’s what we hope to find there, too. When you are stressed or worried or afraid, where is a “safe place” for you?